Life has a way of taking incompatible people and forcing them together to do remarkable things – like Apple’s Steve Jobs and Steve Wozniak or DNA “double helix” discoverers Francis Crick and James Watson. And for some reason, entertainment has been awash in these creative “frenemies.” Martin and Lewis, John & Paul, Sonny & Cher, Simon & Garfunkel. The state of being half of an entity hangs over Stan & Ollie, the remarkably touching film based on the aging comedy stars Stan Laurel and Oliver Hardy’s alternately sad-and-triumphant final tour together in the ‘50s in music halls around the U.K. 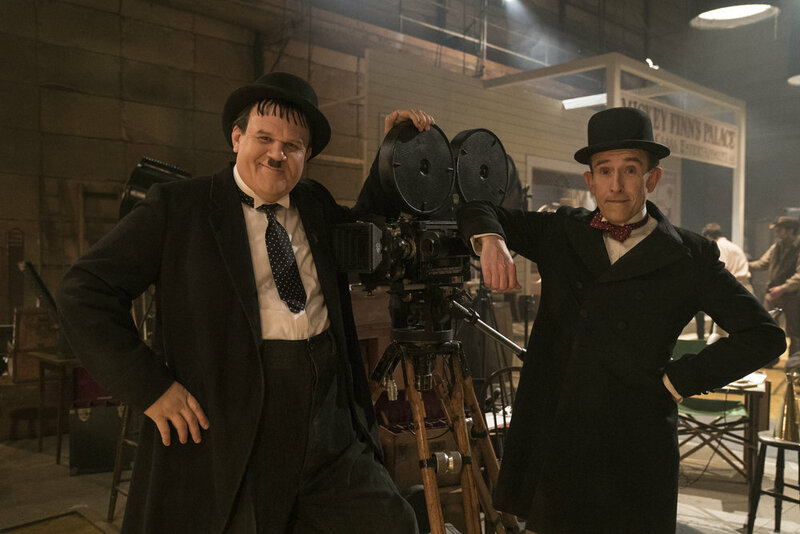 Directed by Jon S. Baird (Filth), and brilliantly acted by Steve Coogan and John C. Reilly, Stan & Ollie is not a bio-pic in the conventional beginning-to-end sense. It begins, briefly, in the 1930s, when Laurel & Hardy were among the biggest box office draws in the world, and were certainly the most famous comedians. They were still under the employ of producer Hal Roach, who’d randomly thrown them together in the ‘20s with instant chemistry – creative if not personal – as the result. And Laurel, who was the proactive member of the duo, wanted them to be paid commensurately. Hardy, who was happy being underpaid as long as he was paid enough to carouse and gamble, didn’t share his partner’s zeal for fair pay. As a result, Roach rewarded the “faithful” Hardy with a new partner, a short-lived disaster, but a betrayal we see continue to haunt Stan and Ollie 20 years later, as the obese and unwell Hardy sweats his way through stage routines and Laurel frantically tries to make one last movie – a Robin Hood farce – happen. The conundrum is embodied by an exchange between the two when they come to a late impasse. “I loved us,” Laurel says. “You loved Laurel and Hardy, but you never loved ME,” Hardy replies. And speaking of married… Stan & Ollie really takes off when our aging heroes, who are playing to half-filled houses all over the British countryside and being shunned by a smarmy producer, are joined by their spouses. Shirley Henderson is spot on as Lucille Hardy (Ollie’s third and last wife), a soft-spoken but determined woman devoted to a man she seems to understand better than anybody. But the movie is all but stolen by Nina Arianda as the imperiously demanding Russian Ida Laurel (Stan’s fourth and last), whose chief contribution to the narrative is to say out loud (and loudly) what everyone is thinking, in the most provocative way possible. Stan & Ollie was largely ignored during awards season, but Arianda has been especially deserving of supporting actress recognition. People expecting plenty of Laurel & Hardy style laughs will be disappointed, obviously, given the movie’s comedy-lions-in-winter theme. But this thoughtful portrait of a long-lasting professional marriage rings touchingly true. Stan & Ollie. Directed by Jon S. Baird. Starring Steve Coogan, John C. Reilly and Nina Arianda. Opens in Toronto, Vancouver and Montreal on Friday, Jan. 17.